IP44 Waterproof Level - Starry Lights can use both indoor and outdoor use. Perfect for Festival, Garden, Christmas, Wedding, Holiday and Party. Warranty Service : 24 Months warranty service. please contact us before leaving any negative product review. Super high quality led lights - high brightness to light up and widespread lighting source,it has excellent heat dissipation,high electric energy convert rate and energy saving.Curtain light's specification: 3x3m(9.8x9.8ft) length, 3.5m(11.5ft) leading wire, 12 strings, 300 LEDs. Easy to install & Waterproof - Just plug and play, no more procedures or notes. IP44 Waterproof design makes it be the best choice for brighting up the happiness atmosphere both indoor and outdoor decoration. 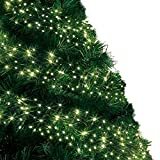 Perfect decoration - Christmas tree, wedding, party, festival, Holiday, restaurant, hotel, commercial building, shopping center, pub, club, concert, hall, cabaret, fashion show, windows, etc.180 Days 100% Satisfaction guarantee and our friendly service - 12 hours email customer service response. Transparent PC shell, product size: 7CM diameter * 3CM height, universal remote control. Colour control modes: ON/OFF, 16 different static modes, 4 dynamic color changing modes. 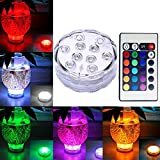 Reusable, submersible LED lights, waterproof and wireless and are thus perfect for lighting up vases, bowls, or any water filled table centerpiece without smoke or dirty wax to deal with. Can turn a boring bowl into a beautiful and exciting centerpiece, are often used for event design. Power Battery: Replaceable battery, 3pcs AAA baterry(not included). 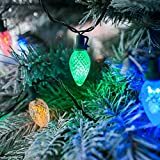 .The flickering bulb flameless LED Lights are ideal for decorations, on table or other place in restaurants, home and garden wedding, party, festival decorations,also good for Harry Potter Party decorations. 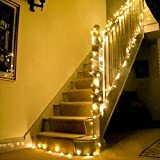 let you add a festive or romantic glow to any place you need. 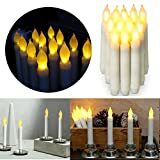 .Battery Powered candles easy to use,removing the spring in the cap,turning it 180 degrees and reinserting 2 AA battery(Batteries Not Included ),press turn ON/OFF button. 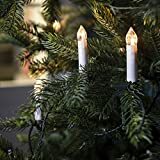 .Flameless LED Candles Without fire, smoke and These LED small candles light can be used without having to worry of flame, absolutely no fire hazards or burning risks, safe for families with pet(s) or young child. 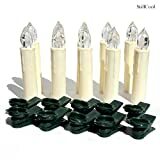 .What you get : 12pcs 6.5" H x 0.9" D Flameless LED Candles,Risk Free Purchase,100% Satisfaction Money Back Guarantee. Click on the 'add to cart'. 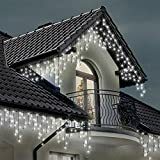 KooPower 100 LEDs battery operated weatherproof string lights can be used indoors or out without trailing cables or an external power supply. Timing program (6 hours on, 18 hours off) provides a set-and-forget operation; Please set the mode you need before switching to 'TIMER' for timer function; Removing or changing the batteries will delete all previous settings. Variable mode (8 Modes) and brightness settings provide the perfect solution for your decorative lighting needs; Memory Function: Once the mode is selected, the light will work in this mode next time and you don't need to worry about re-set until battery power is depleted. Dust- and waterproofing to IP65 level makes these lights suitable for use in conditions where dust, rain, spraying water, snow or frost are likely. 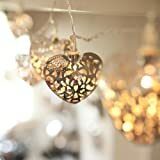 Perfect for use at Christmas, Easter, other celebration events or simply to give your home a novel warm inviting glow. Safe for Children ,easy for DIY decoration. Two modes : Flash and ON . Lights could be used indoor &outdoor without any worry of moisture or weather damage or short circuit. Low power consumption,Super-bright but running with low temperature. High quality and one year guarantee. 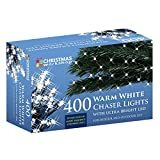 These lights come with a Transformer and 8 Multi-Function Control- combination, waves, sequential, slow glow, chase/flash, slow fade, twinkle/flash, steady on. 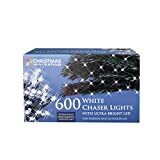 Perfect for decorating the interior of your home or place of business, these fantastic Christmas lights can really help to spread a positive seasonal atmosphere around your property. More than 1000 Red,Green color points,over 100 square meters of brilliant,beautifull star light. Copper material inside,clear shell color. Ideal for indoor decoration, it will work properly even though in cold winter. 20m string in length,200LEDs. 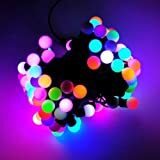 Six light color available,white,warm white,red,purple,blue,mixed color. AC 220-240v input power source, low voltage output, UK plug, safe. Super bright with eight flashing functions: Combination, In Waves, Sequential, Slo-Glo, Chasing/Flash, Slow Fade, Twinkle/Flash, and Steady on. Suitable occasions / events: home, office, restaurant, bedroom, children's room, living room, shelf, bed, Christmas, Christmas tree decoration, New Year parties, birthday parties, wedding, dinner party etc. Ideal for draping around mirrors, mantelpieces and headboards and of course around the Christmas Tree! NATURAL EFFECT of METEOR SHOWER: Each LED bulb turns on, out one by one slide in sequence, just like the shooting star in the sky, very beautiful; Connection others, can give you a big meteor shower, very spectacular. LED doesn't get hot after long-time use. low voltage makes it safe for daily use in your home. Available for all kind of (outdoor/indoor) party or wedding, and very convenient for adorn and store. Widely Used: The window icicle lights is IP44, so it can be anti-cold , waterproof and against frost!it will work properly even though in cold winter. 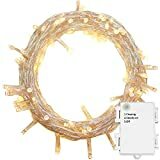 Ideal for indoor and outdoor decoration,it can be hung on walls, windows, doors, floors, ceilings, grasse, Christmas trees, etc. Higher Safety: BS certificated waterproof plug, safe low voltage (36v) and misplug-proof connectors hugely increased the security. High brightness LED is energy efficient, cost saving, environmental protection and long lifespan. Memory Function: The controller has memory function, which could recover from the previous setting mode when you restart. 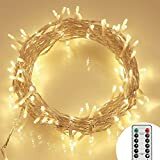 Specification: 3x3m(9.8x9.8feet) length, 3.5m(11.5feet) leading wire, 25leds/strings, 12 strings, BS waterproof plug, misplug-proof connector and CE controller. Manual, line mark, packing bag and packing box are also included. 90 Days 100% Satisfaction Guarantee and Our Friendly Service - 24 hours email customer service response. Suitable for Hotels, bars, home decoration, churches, temples, Christmas Day, birthday parties, on the beach, on the grass, home decoration, etc. 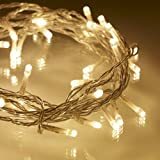 PREMIUM QUALITY: AMIR Fairy String Lights with 20pcs bright micro LED bulbs on 6.2 feet flexible, durable copper wire. 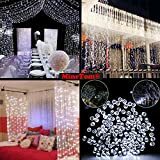 With these starry string lights, you can also make a stunning centerpiece for a lovely dinner party or decorate your wedding reception table, adding some dreamy touch to your big event. 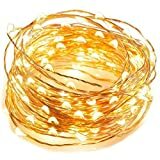 MOLDABLE SHAPES: AMIR Fairy String Light made by flexible copper wire can be easily built into any shapes you want. 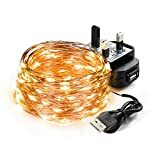 This Waterproof LED String Lights with Clear lights is the best choice to wrap around desk or gazebos. The wire for the battery operated string lights is invisible in the dark, leaving only the bright lights. 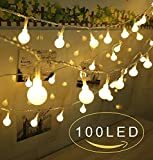 CE CERTIFICATION: This LED String Lights Guaranteed with CE & ROHS certification.The DIY LED String Lights are powered by 2 AA CR2032 batteries, Energy-saving and environmentally friendly, very low heat generating and safe, you can hang it in any place to decorate. 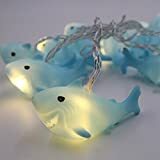 IMPROVED WATERPROOF: This Fairy String Lights Insulate Copper wire and fully sealed LEDs make it possible to immerse the copper wire part into water，however the battery box is not, it should be covered if used in rainy days. 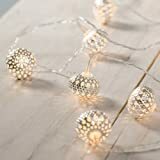 MINI SIZE: This Indoor Outdoor Starry String Lights build to be portable. The size of battery pack is only 0.9*2 inches, you can easily carry and place the lights anywhere you like battery compartment is with ON/OFF switch; no worries of where to find a outlet. 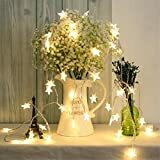 ※EXTREMELY ADORABLE LED STRING LIGHT: Look like stars, ultra bright and pretty 20 LEDs make everything attractive, starry fairy LED light will create elegant romantic atmospheres. 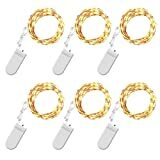 ※TOP-OF-THE-RANGE COPPER WIRE LIGHT: 2 meters ultra thin flexible silver lacquer coated copper wires, are flexible and bendable. you can shape it into any appearance you want. ※CR2032 POWERED AND WATERPROOF LIGHT: Powered by 2*CR2032, with energy efficient no overheat after many hours of usage, safe to touch after any hours of usage. Wires are waterproof so it is feasible to use it outdoors. 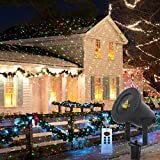 ※VERSATILE DECORATIVE STAR STARRY LIGHT: Decor light is perfect for upgrading the sense of your place, adding romantic atmospheres for whether it's your Christmas tree, Landscape, Lawn and Patio, Wedding and Party décor, Garden and Yard. ※CUSTOMER SATISFACTION GUARANTEE: We promise 2 years warranty for quality-related issues for every TOPSHARP products and kind reliable customer support. 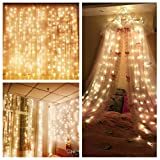 If you are not satisfied with the string Lights, feel free to contact us, our customer service are glad to help you. 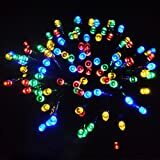 Add the finishing touches to your Christmas display with this fantastic LED light set. 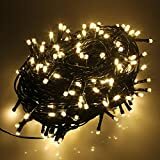 The lights would look fantastic anywhere from Christmas trees to Garlands, the perfect addition to any Christmas display. The lights are LED lights so are low voltage and shine very bright they are also are battery operated. The lights are on a 3m lead wire. Please note batteries are not included. 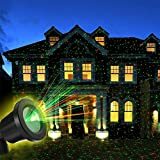 ICICLE INDOOR/OUTDOOR BRIGHT WHITE LIGHTS: Ideal for decorating outside buildings, around trees, fences or to create spectacular Indoor light display. 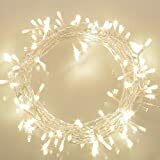 Perfect for Roof, Christmas Tree, Festive, Wedding/Birthday Party Decorations. 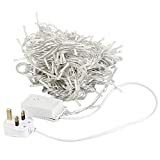 CHRISTMAS DECORATION LIGHTS: 14m / 46 ft with 10m / 33 ft Lead Wire. 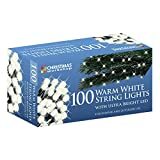 Set of 480 Ice White Multi functional Icicle LED lights come with extra-long 10m lead cable to the first bulb. 8 MODE FUNCTIONS: 8 Mode functions provide the perfect solution for your decorative lighting needs. Multifunctional Icicle Lights come with 1. Combination 2. In Waves 3. Sequential 4. Slow Glow 5. Chasing/Flash 6. Slow Fade 7. Twinkle/Flash 8. Steady On modes including a static setting. The memory function allows the lights to be set to a preferred setting-There is no need to reset when they are switched on again. PEACE OF MIND: Click "Add to Basket" confidently and we are offering ANSIO's 12 Months Warranty (online exclusive) - In the rare event when you have a complaint or problem contact us before leaving any negative product review. 1. 20PCS Replaceable slides. moon, heart, snowflake, snowman , necktie, wineglass, ghost, skullcandy and so on. Replace different patterns in different occasions. 2. Weather-resistant & Waterproof .The projector light is made of IP44 waterproof material. which makes it suit for both indoor and outdoor. But please do not put the plug underwater or in heavy rain. 3. Sharp images and soft light. The projection effect is fabulous and the image is very clear. And soft LED light could protect eyes as night light for baby kids. 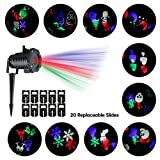 This Lampwin snowflake projector light comes with a stake, can be easily inserted into soft ground. Low voltage, UL safety certificated, very safe to use. 4.Rotatable light heads and images. The light head will project to any direction as long as you tighten the screw on the side of it. The image is rotatable as well. You can adjust the speed of rotation of image by a button. 5. Wide application. 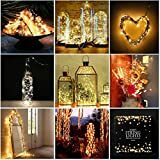 Perfect decor for you Christmas, Valentine's Day, New Year, and so on.The light creates an amazing atmosphere for fun and celebration. 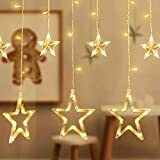 Suitable for the living room, bedroom, baby room, kitchen, dining room or in the garden, when the parties are ready to give their children, so hanging light string, will be very compelling, children will love to scream.